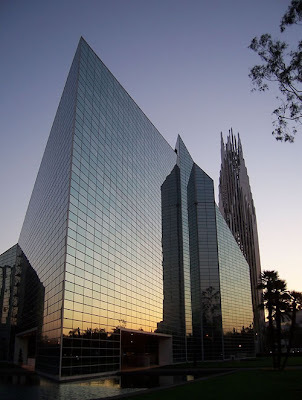 A years-long haul -- and $57.5 million -- in the making, tomorrow brings the Orange diocese's formal announcement of the new Name for the soon-to-be seat of its 1.3 million-member church: the celebrated Crystal Cathedral, heretofore home of the "Hour of Power" with Rev. Robert Schuller... and, now, Bishop Tod Brown. Suffice it to say, it would seem that The Answer -- a considerably more high-church One than some would think SoCal Catholicism ever capable of conjuring -- is already made flesh in our midst. According to reports on the ground, Brown -- who reached the mandatory retirement age of 75 last November -- is to reveal the Crystal's Catholic Name at the close of a morning (Pacific time) ordination Mass at a parish church in Garden Grove, close by the new cathedral's 31-acre site. Four priests will be ordained at the rite. Keeping with the community's emergence as the US church's "new Irish" in terms of priestly and religious vocations, all of the men are of Vietnamese descent. While Asians comprise roughly four percent of the 70 million American Catholics, the bloc comprises nearly a tenth of this year's national ordination class. According to CARA figures, among the 30 percent of 2012's nearly 500 new priests born outside the country, Vietnam was cited as their most hailed-from homeland, followed by Colombia and Mexico. California's second-largest diocese after the 5 million-member LA juggernaut, Orange bills itself as the nation's tenth biggest local church. Several other dioceses report an equal population to the one-county see's roughly 1.3 million Catholics, including Detroit, Miami, and Galveston-Houston. While Holy Family church in Orange city was designated the official diocesan seat when the county was spun off from Los Angeles in 1976, practically all Orange's "cathedral" events in recent years have been held at one of the diocese's leading parish churches. Back to the Crystal, before its eventual consecration -- eyed for 2014 -- the Protestant landmark is to undergo an extensive internal redesign to make it suitable for Catholic liturgy. What remains of its prior congregation is expected to move shortly to a Catholic church whose community will comprise the new cathedral parish.